People born under the Libra Metal Snake sign are known to be diplomatic. When there is a fight, they will have the best judgement to settle it. They are idealistic which helps them move forward easily. The LMS is a determined character and will be able to see straight to their goal. Making sure nothing gets in their way because all they see is reaching that finish line. They are also self-reliant and will be able to take care of themselves. When they are in trouble, they are able to find a solution to get out of it. The Libra Metal Snake is a graceful animal. The way they talk, move, and behavior shows that they are elegant. They are very wise which allows them to provide sound advice. 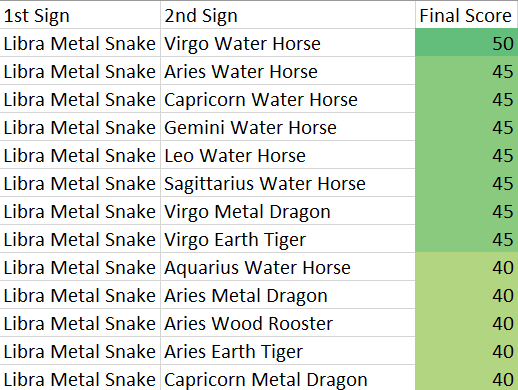 On the other hand, Libra Metal Snakes can be very indecisive. Why, because of the scale, they want to make the fairest decision and choosing one side can be a nightmare for them. If there is something they desire badly, they can become self-indulgent in which they will keep doing what they want. The LMS can become an unyielding person. If you wrong them in anyway, guess who’s going to be the first one to apologize. Many times, they can also be impulsive and will act on their feelings rather than using their logic. Worst of all, Libra Metal Snakes can be one of the most malicious animals. They sometimes don’t mind using unpopular ways to achieve what they want which can hurt other people. This sign is also possessive which they will hold on to things and people even if it is not the best interest for other people.